This is a follow-up on the little article on Warren where it reveals to me the reason why inflation will return and return with the clear intent of destroying the massive debt largely created by greed unbridled by regulation which, to be fair, became and continues to be out-of-date as the world's economy continues to expand. I like this article by Eric Fry which includes another version of the earlier chart. It ponders their (Buffet and Munger) establishment view and their approach to talking gold down. "Gold is not merely a great thing to own amidst extreme circumstances. It can also be a great thing to own amidst merely marginal circumstances, for example, if you happen to be living during the tail end of one of the most powerful, world-dominating economic expansions in human history. . .rather than at the beginning of it." 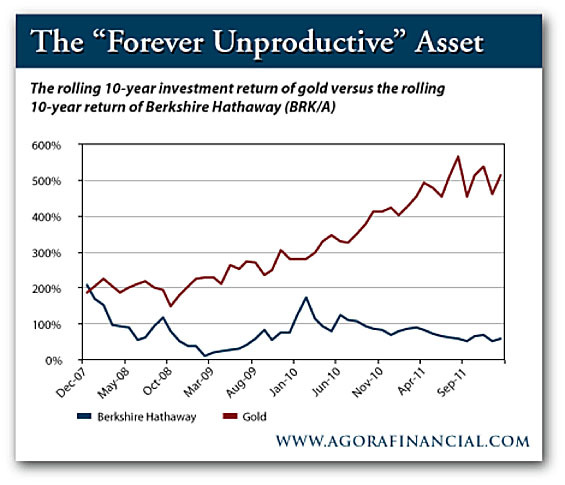 Gold is "forever unproductive," says Warren Buffett, CEO of Berkshire Hathaway. "Civilized people don't buy gold," says Buffett's sidekick, Charlie Munger. Civilized people, says Munger, "invest in productive businesses." So let's see. . .Where does that lead us? D) Buffett and Munger are civilized. But to make sure the world appreciates just how civilized these two civilized gents are, they continuously (and very publicly) belittle both gold and the uncivilized masses who consider it a store of value. "Gold gets dug out of the ground," Warren Buffett famously observed, "then we melt it down, dig another hole, bury it again and pay people to stand around guarding it. It has no utility. Anyone watching from Mars would be scratching their head." I've been spreading the rumour for some time now that Warren is negotiating to buy a gold mine; as you say - "he isn't stupid". It will not surprise me in the least, when gold approaches $2,000 that the blogs will be filled with stories of how the "smart money" was buying precious metals related investments during the doldrums of 2012. Think; Soros, Gates, Buffett, Slim, etc.